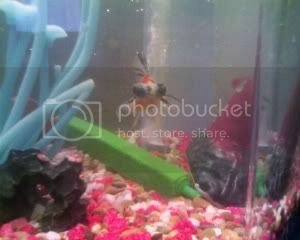 Boggley, our wonderful telescopic eyed fantail goldfish, passed away yesterday evening. It was a quick death, he'd only looked peaky for a few days, and we're going to give him a burial tonight. 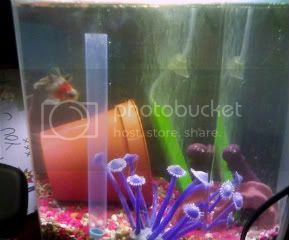 He was a great fish and was the longest resident with us in this flat; we had him since the Christmas before last. He had a great life with you and you took great care of him. I'm glad he gave you so much pleasure. Thanks everybody. He was a super fish, I can't believe it all happened so suddenly. I wonder what caused it? It can't have been old age...! RIP little Boggley, he brought many a smile to our faces.